I love adding vegetables to muffins. Grated vegetables not only add more nutrients, but they also add more flavor and moisture. Zucchini is plentiful and inexpensive most times of the year, so today I grated a large zucchini and added it to my muffin mix. The beautiful thing about this recipe is that you can use replace the zucchini with grated apples or carrots. These zucchini muffins are also a healthy food choice for children. Since there is no refined sugar, it is the perfect vehicle for adding more fruits and vegetables to your child's diet. They also make excellent vegan snacks. I like to make a big batch, freeze them individually and just grab one for my purse when I'm on the go. On the health side, zucchini boasts a rich nutritional profile that includes an excellent source of Vitamin C. Zucchini is also low in calories. One cup is approximately 25 calories. I sweetened the muffins with maple syrup and a small amount of maple sugar on top which is optional. Please make sure you use pure organic maple syrup and not maple flavored syrup which is loaded with refined sugar. 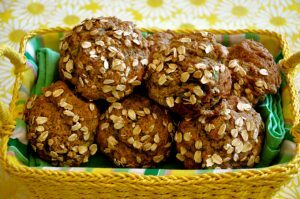 Hope you enjoy these plant-based zucchini muffins as much as I did. Wishing you a peaceful and compassionate week. Don't miss any of Ordinary Vegan's free recipes by signing up here. Substitute the grated zucchini with grated apples or carrots. You could also add ⅓ cup of raisins or nuts. Add the wet ingredients to the dry ingredients and stir gently but thoroughly until absorbed. Lightly grease a muffin pan. Fill the muffin cups ¾ high with the muffin mix. In a small dish combine the topping ingredients. Top each muffin with a sprinkle of topping. Bake for 40-55 minutes or until a toothpick inserted in the center comes out clean. Let cool for approximately 15 minutes.